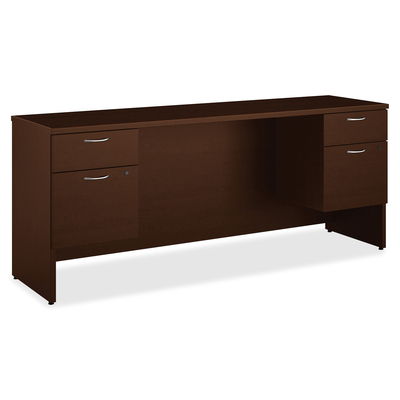 This 72" wide credenza with kneespace is part of the HON 101 Collection that helps you create a stylish, professional work space. It offers the perfect combination of additional worksurface and storage capacity. Durable, thermal-fused, Mocha laminate over solid-core particleboard is scratch-resistant and stain-resistant. Durable edge detail provides the finishing touch that makes a lasting impression. Credenza can be used with a double-pedestal desk or as a standalone unit. Worksurface and end panels are 1" thick; modesty panel is 5/8" thick. Clear inside depth in kneespace is 17-1/4". Locking, 3/4 pedestals include two box drawers and two file drawers to keep the office tidy and organized. The file drawer offers front-to-back letter-size filing and side-to-side legal-size filing with built-in hangrails. For access to wall electrical outlets, use the cord pass-through gap below the modesty panel. Adjustable leveling glides have a 3/4" range.